MH Travel has created this tour especially for guests who stay in Budva and Budva's Riviera. Some guests prefer to stay in a place where they are surrounded by beaches and they prefer to see the main attractions in Montenegro by daily excursion. Budva has a central location on the Montenegrin coast and the distance from Budva to Kotor is only 25 km. This tour is a perfect daily option for visiting Kotor from Budva for a good price. Kotor is the only town in Montenegro protected by UNESCO world heritage. That makes the city of Kotor very popular among the tourists all over the world. But in relation to Budva, city of Kotor isnot allowed to grow so fast and make new buildings as much as Budva can. Landscape cannot be changed at least as Kotor is part of the World Heritage. So, Kotor itself has limited capacity, but Kotor is the most visited town among international tourists thanks to cruise ships, which arrive in Kotor up to 3 times per day. Port of Kotor is next to the old town and one street leads trough that zone, so the traffic jam sometimes can be problematic. We take that into consideration and make our tour and try to avoid potential problems. 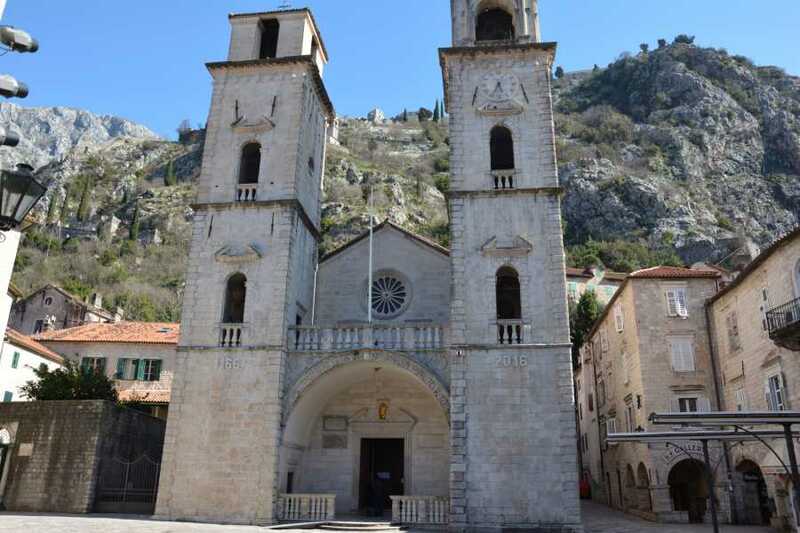 The tour starts from Budva and goes straight to Perast, which is a part of municipality of Kotor and has been protected by UNESCO since 1979.Its main attractions are two small islets St George and Our Lady of the Rocks which make Perast well-known in the touristic world. On each of the islets there is a church. Church on St George islet is closed for public except during some rare events, while Our Lady of the Rocks islet and church can be visited. When we arrive to Perast our guests will be taken with a boat to the man-made island Our Lady of the Rocks where a professional guide will explain the history of the islet, its church and museum. The way the island rose from the sea is a beautiful and authentic story. Visiting Lady of the Rocks is not obligatory but most guests do visit and after that guests will be able to explore the old town Perast with its main attractions: St. Nicholas church with its belfry, the town square, the Maritime Museum, as well as many traditional palaces and churches built in the 16th century that still keep their authentic looks. Although Perast is the tourist epicenter of Boka Kotorska's, it still preserved the dignity of a peaceful town in which the spirit of past times is truly felt. Spared from modern buildings, cozy shops, fast food restaurants, souvenir shops, and everything else that accompanies modern life and tourism in Perast as if the time stopped. Even traffic in the city is closed in the summer months so tourists can safely walk around and see the city. Some guests can take a break or have breakfast in one of several lovely restaurants by the sea. After visiting Perast we will go to Kotor and firstly we will visit the famous city walls and make some impressively beautiful pictures from Kotor panorama. Thanks to city Kotor becoming a part of UNESCO World Heritage at 1979. We have enough time to go up to the church of St. John and enjoy the view. We will slowly go back down to the main gate of the town where guest will get guided city tour of 1 hour. Our professional guide will take you around the Old Town and show you the most important historical monuments and buildings in town: Square of Arms, Bizanti Palace, Beskuca Palace, Pima Palace, St Tryphon Cathedral, Maritime Museum, St Nicholas Church, Blessed Osanna Church as well as the north gate. After the city tour guests can use some of the free time to by some souvenirs because old town is full of souvenirs shops and some of them have authentic souvenirs made by a local artist. We should head back to Budva around 15:00 and arrive on time for sunbathing and swimming on Budva's riviera. Guests who want be dropped on Jaz beach can do that easily. Tour is organized by air conditioned cars or mini vans or mini bus. Entrance fee for Lady of The Rocks with both ride and guided tour of 5 euro. NOTE:guests who want to bring their luggage on the tour and finish the tour in city of Kotor can easily do that. There is no luggage fee.